Dominating the skyline of Athens, high above the city, is the famous Acropolis, one of the most recognizable monuments in the world. 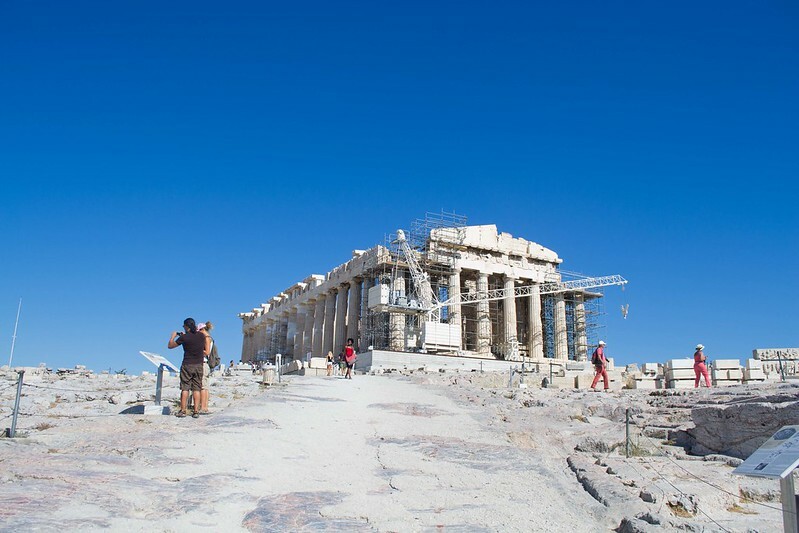 The Acropolis, and especially the Parthenon, is a symbol of ancient Greece and democracy. 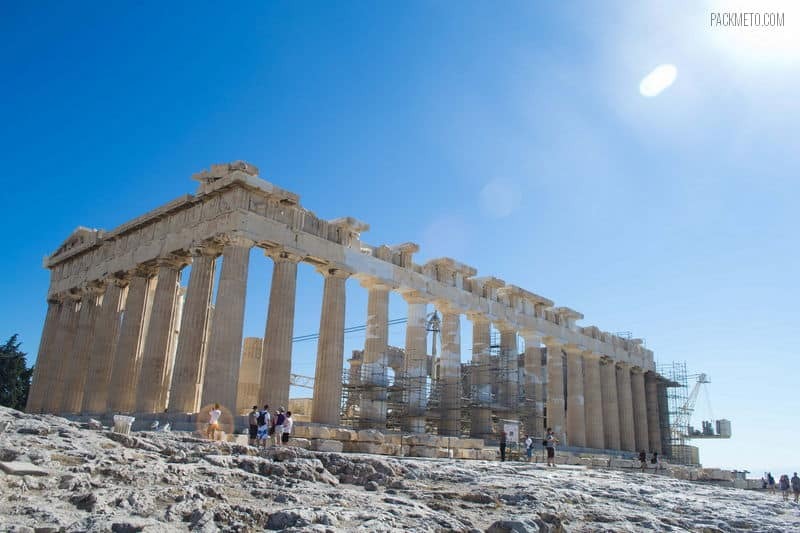 Built in the 5th century BC under the direction of Pericles, the Acropolis is made up of a series of buildings, and today it is a UNESCO World Heritage Site and a must-visit for anyone in Athens. 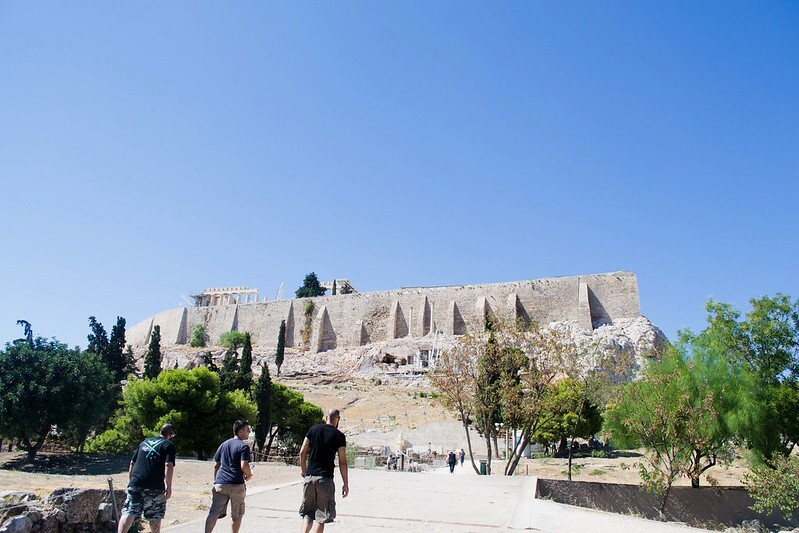 Getting into the Acropolis is easy thanks to its two entrances, one in the north by Monastiraki and the other to the south by the Dionysiou Aeropagiou pedestrian street. While the south entrance passes by two ancient theatres and offers a gentler incline to the Acropolis, the north side is recommended by many due to its cultural significance, although it has a much steeper incline. Regardless of which you choose, be prepared for the steps. Much of the pathway is clear, but occasionally there are loose rocks, and, in some parts, the path is worn due to many footsteps over time. Go early to beat the crowds, and in the summer, avoid the draining heat. 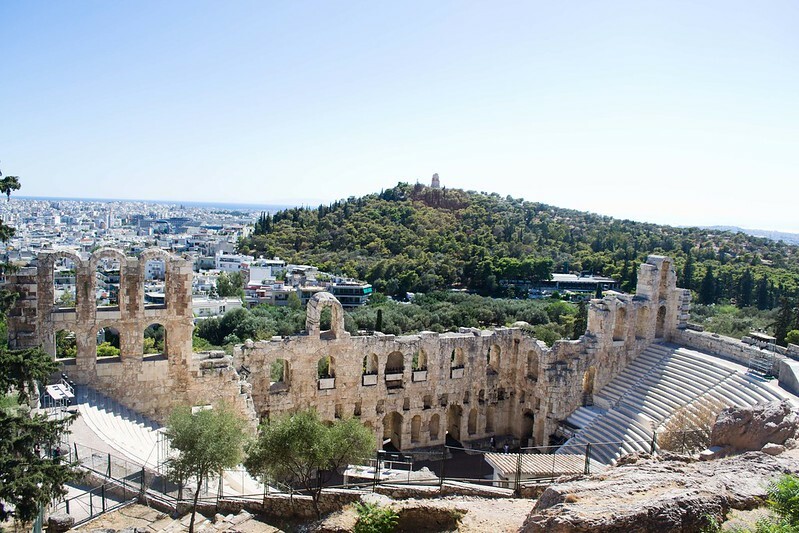 If entering from the south, be sure to explore the Theatre of Dionysus, which dates back to the fourth century BC, and the better-preserved Odeon of Herodes Atticus, which is now a prominent performance venue. 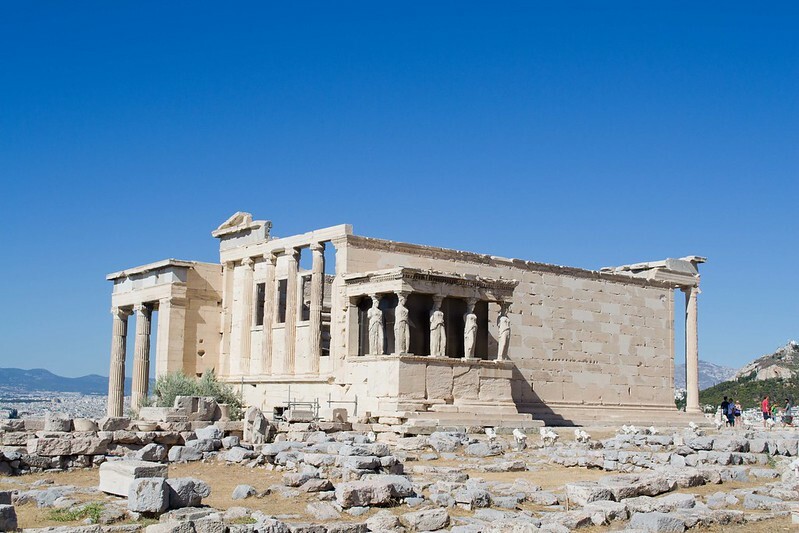 Providing a grand entrance to the Parthenon is the dominating Propylaea. 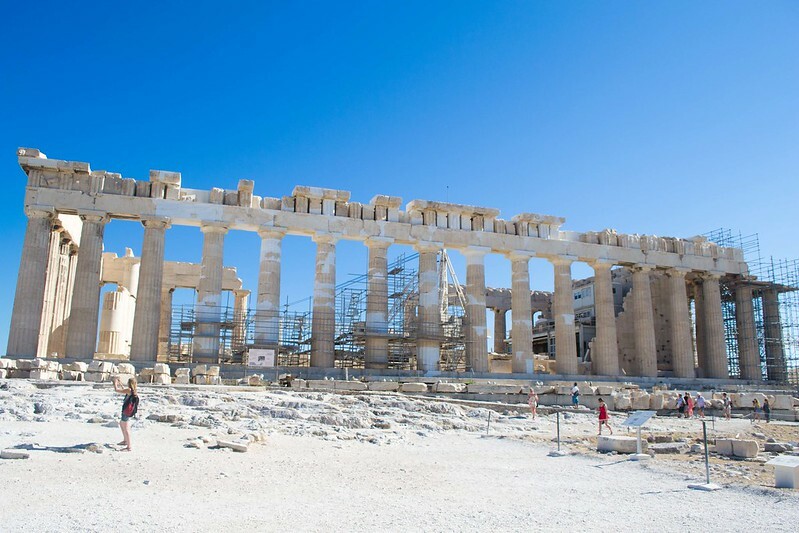 Built from marble, it provided security to the other buildings within the Acropolis. Other historical buildings like the Brandenburg Gate in Berlin and the Propylaea in Munich mimic the centre columns found here. Doesn’t look as grand these days due to all the scaffolding and repair work. From a distance, the Parthenon doesn’t look that big, but its sheer size and magnitude is clear. 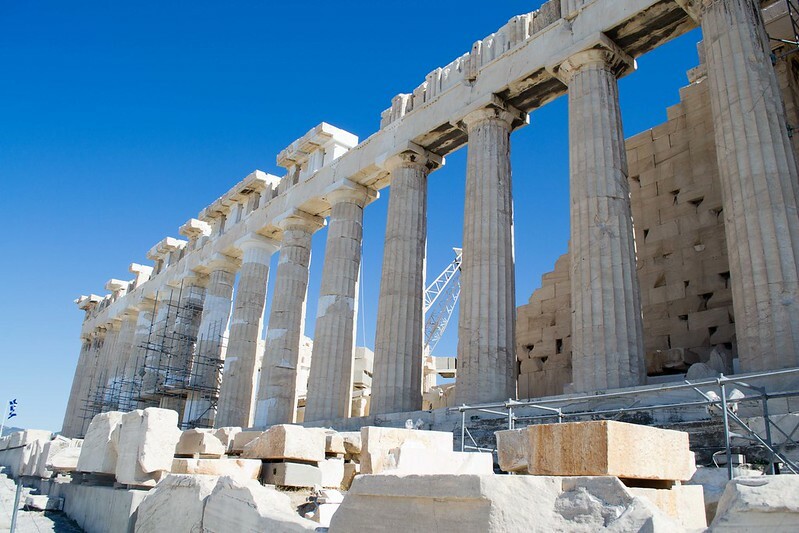 The Parthenon was built to honour the goddess Athena, who the people of Athens considered their patron. It has experienced quite the violent history, with it exchanging hands many times, and even now, there is controversy over marbles that once adorned the building. Scaffolding and various other construction materials have surrounded the buildings on the site for years. While detracting from the overall aesthetics of the building, this is necessary work to preserve the building for future generations. Other buildings of note at the Acropolis include the small Temple of Athena Nike and the Erechtheum. Despite its size, the Temple of Athena Nike has significant importance as the first Ionic style building in Athens. The Erechtheum is said to have held some of the most ancient artifacts of the time and is famous for the Caryatid Porch which features beautifully carved maidens and supports the building. You can see the Caryatid Porch and the carved maidens of Erechtheum in the centre of this shot here. 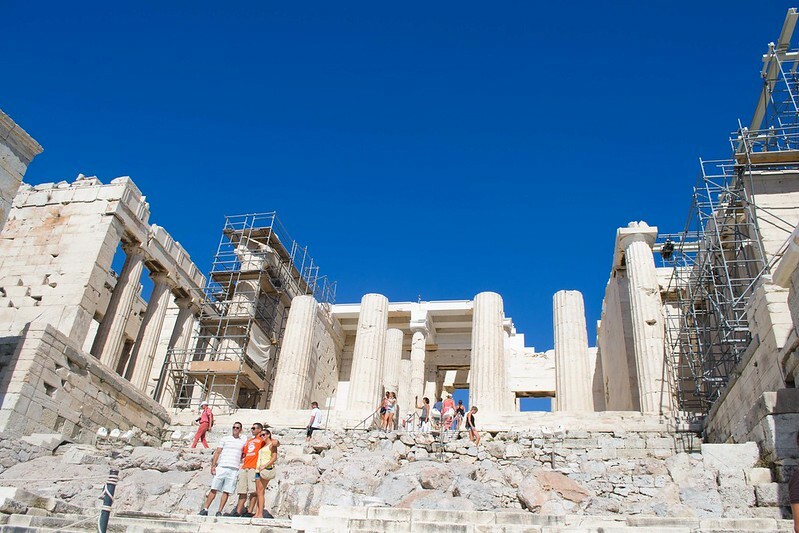 Purchasing tickets for the Acropolis also grants you access to six other archaeological sites in Athens, including the North and South Slopes of the Acropolis, Ancient Agora, Hadrian’s Library, Roman Agora, Kerameikos, and Olympieion. This combined ticket cannot be purchased in advanced or online, but you can buy it at any of the other archaeological sites as well. 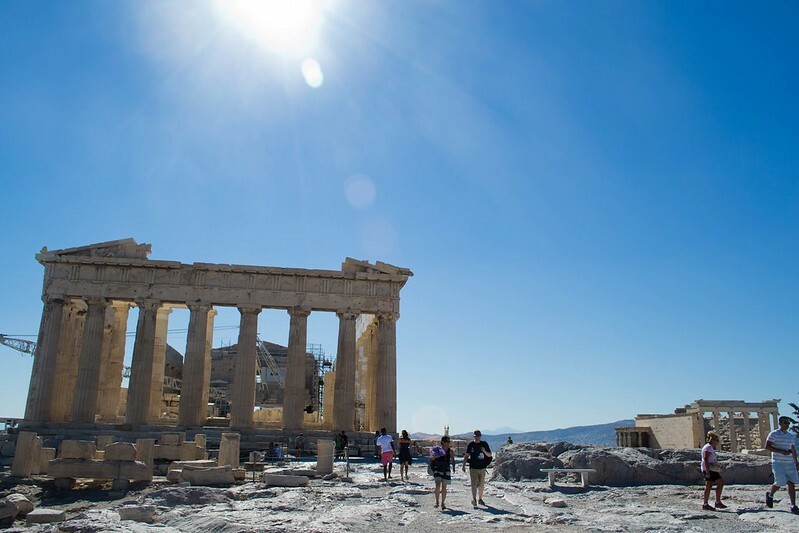 Have you visited the Parthenon? What was your favourite building? Oh booo. No water in the Trevi Fountain?! But how are you suppose to throw a coin in it? Maybe the restoration project won’t be as intense during your visit. Have a great time in Athens! Wow! I’ve never been to Athens (only to a couple of the Greek islands) but these ruins look absolutely spectacular! Shame about all the scaffolding but I guess it’s important it’s done. Ooh, you need to go to Athens the next time you’re in Greece then! It’s such a different vibe to it, but similar to any large city. There’s tons of history though. but seriously, I know it was hot probably but the weather was perfect for you because the photos are STUNNING! It was RIDICULOUSLY hot. I think every sentence was me complaining about how hot it was. I would NOT recommend visiting in August. Bad bad idea. I guess the silver lining is that I did get some good photos haha. That makes the photog in me happy. I want to see this so badly! I might get frustrated with the scaffolding in my photos, so it’s good to know about a head of time. I didn’t know about all the other sites to visit. I love historic sites! Thanks for sharing great info! Thanks Nancie! There is so much history in Athens. It’s great to explore! Hopefully you’ll get a chance to visit soon. This is def a place on my list to go very soon. I will refer back to this post before I go. The scaffolding does ruin everything. When I went to Rome the Coliseum had scaffolding too. Kinda ruined it because of that. Thanks Holly! I hope you get a chance to go soon. The scaffolding does make it hard to appreciate the beauty, but its necessary to make sure it stays upright! I feel like most of Europe is under renovation haha. Disappointing, but important nonetheless.